Used 2005 Chevrolet Impala LS Four Door Automatic 2 wheel drive - front Laser Blue Metallic Exterior Medium Gray Interior 157,954 mi. 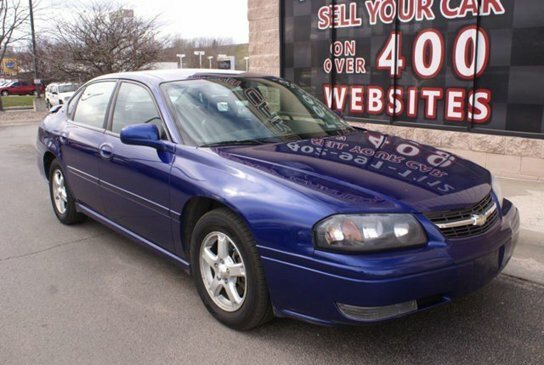 Check out this nice 2005 Chevrolet Impala LS! This car looks and drives excellent! It's loaded with options including a 3.8L V6 Automatic Transmission, Leather, Dual Climate Control, Steering Wheel Controls, CD, OnStar, Power Seat, Power Windows, Locks, Mirrors, Tilt, Cruise, and more! Overall this car is very clean inside and out! It's priced to sell ASAP so call 402.991.1112 now! Get Pre-Approved now on our website http://TheInternetCarLot.com or call us at 402.991.1112! MORE PHOTOS CAN BE FOUND AT OUR WEBSITE www.TheInternetCarLot.com ! The Internet Car Lot helps match private party sellers with private party buyers along with maintaining our own large inventory of vehicles we own. The majority of our vehicles are not stored at our dealership so we ask that you please call to setup an appointment to see the vehicle at our dealership. Please call us to setup a showing 402.991.1112. Disclaimer Price excludes government fees and taxes, any finance charges, any dealer document preparation charge, and any emission testing charge.